Primary Inspired: Hippity Blog Hop! Get ready for some big time fun, friends! I mean some blog hoppin' fun! We're going to be hippity hop blog hoppin'! Thanks for hopping over from Granny Goes to School.Hope you're having tons of fun hopping from freebie to freebie! 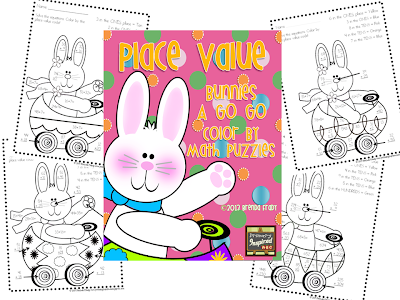 On this stop of the bunny trail, you'll find a fun Color by Place Value activity pack. There are eight activity pages that focus on hundreds, tens, and ones. Click on the picture to add your free pack to your basket!! Your next hop is to Mrs. Wheeler's First Grade Tidbits. What are you waiting for?! Get hoppin'! And stop by tomorrow when we'll be Zippin' Down the Bunny Freebie Trail! What a fantastic freebie! Thank you so much for participating! I am just loving each stop! Love the freebie! So glad I found you through the blog hop! Thanks!! Glad to meet you! This is wonderful! I am following you, and pinned it for you too! Thanks so much for a fun blog hop! Wonderful Freebie. Thanks so much. I love your freebie. Thank you so much. Brenda - this is PERFECT timing!!! Thanks so much for the great freebie! I am curious about tomorrow, too! See you then!! Growing Firsties' MEGA giveaway ends soon! I'm so glad it'll work for you! Love your freebie! Thank you! I'm a new follower so I will check back in with the bunny trail tomorrow! Thanks for the cute, creative, and useful freebie! I love how it combines place value and addition practice together. Love the freebie! Thanks so much for sharing your hard work! I featured your freebie on my blog. I downloaded and took a photo snip. I also linked back to your blog! Thank you for the great freebie. My students will love it. I am a new follower. What a precious and unique freebie! Thanks so much!! !